Once used to host Ladies' Afternoon Tea for guests at a grand old hotel on the harbor in Port Clyde and now, this quaint cottage plays host to visitors from all over. 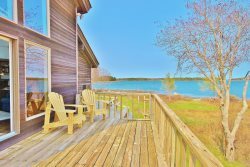 The surrounding property is beautiful – mature gardens, a large green field with cut paths leading to the water and a dock where guests can kayak, swim and fish from. The Tea House is perched atop a large granite ledge – this venue provides privacy and, more importantly, enchanting views of the harbor and the open ocean beyond. See lobster boats leave the harbor in the morning and come back in the late afternoon with their catch. Watch the Monhegan Boat Line set sail several times a day, bringing mail, provisions and visitors to the magical island you can see in the distance from the comfort of your own deck. The cottage is surrounded by a open deck on one side and a covered porch in the front. The deck has outdoor furniture and a grill is provided for your use on the adjacent lawn. Inside, the kitchen, dining and living room are all houses in main room of the house – the original beams are in place, providing a vaulted ceiling and an open, airy and light feel. The kitchen is equipped with basic necessities for cooking meals and the dining area provides seating for 4. The living room has a couch and an armchair – there is wireless Internet only. The bedroom has a queen bed and excellent views of the waterfront. It is cozy and neat – a great place to take a nap or read. There is one bathroom with a single vanity and a shower stall. A small mudroom is also provided – perfect for wet shoes, towels and the like. The Tea House is perfect for a couple who wants to explore the area – a walk into the Village of Port Clyde will take 15 minutes. Eat dinner, rent a kayak, grab a cocktail or head out to Monhegan Island for the day. Sandy Drift Inn Beach is just a mile a way and the Marshall Point Lighthouse is just 2 miles from the cottage. Day trips to Rockland, Owls Head, Cushing, Boothbay and Camden-Rockport are easy from this location as well. Renters may use shared dock with owners permission.